When I wake up on Saturdays I cruise the food pages of The Guardian website. First, I check in with Marina O’Loughlin, whose restaurant reviews are my favourite – slamming prose, sound judgement – then I skim over the week’s recipes. Today I saw Anna Jones’s polenta recipes, there was saffron baked polenta with squash and feta and kale and another recipe for creamy polenta with radicchio and mushrooms. We didn’t have any bread for breakfast and so, prompted by Jones’s baked polenta, I made an egg version with cavolo nero and sheep’s cheese, and used up the remaining chicken stock to cook it in, though water would also work fine. It took 25 minutes to make and was extremely comforting to eat. It would also make a very acceptable dinner. Heat up the chicken stock or water in a pan until it’s simmering, slowly pour in the polenta while stirring vigorously, to avoid lumps. If it gets lumpy, just keep beating it, and also, don’t worry! It’s still edible. Stir over heat for 5-10 minutes. After 5 minutes add a walnut-sized lump of butter and a splash of milk and keep stirring. Add a good pinch of salt and taste, adjust to your preference, bearing in mind that there’ll be salty cheese on top. In another pan, fry the cavolo nero over a high heat with a teaspoon of oil, for about 3-4 minutes, until wilted and slightly charred. Turn the grill onto medium, or pre-heat the oven. Into an oven dish, or several, pour the polenta. 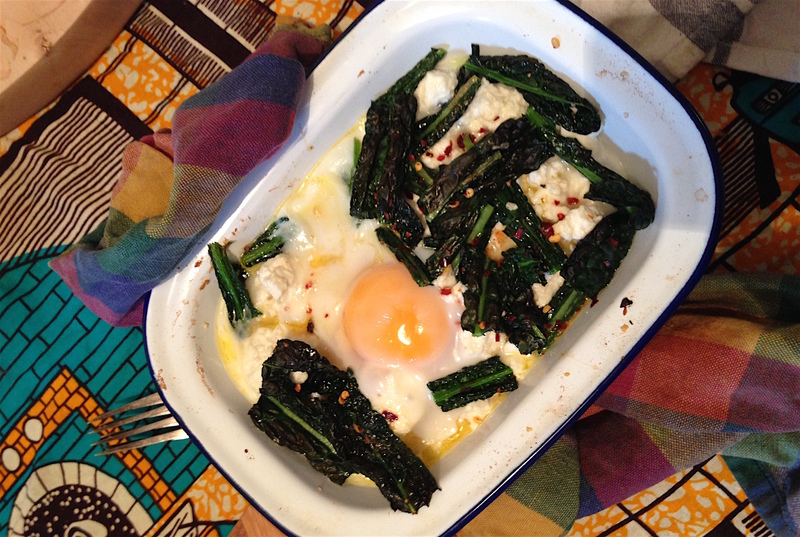 Scatter with crumbled sheep’s cheese, the cavolo nero and a sprinkle of chilli flakes. Make small wells with a spoon and crack in the eggs. Put small blobs of butter on top of the egg. Place under the grill until the eggs are set, and then serve.